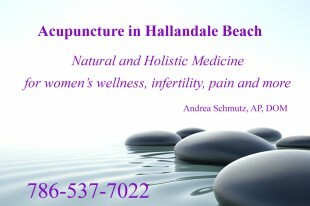 Acupuncture in Hallandale Beach – Andrea Schmutz is a licensed acupuncturist, doctor of oriental medicine and a registered nurse (prior to her training in eastern medicine) with over ten years of experience in pediatric medicine and infertility treatment. She takes her knowledge and understanding of western medical conditions and treats these conditions from an holistic, eastern medicine approach using acupuncture, Chinese herbs, natural supplements and homeopathic remedies. The best of both worlds! This is truly the evolution of healthcare. Located on the border of Hallandale Beach and Aventura Florida, she is just minutes from communities in the Hallandale Beach area. It is worth the short distance of travel! If you live or work in this area you owe it to yourself to pay her new wellness center a visit. It is located at 17971 Biscayne Blvd just behind the Olive Garden restaurant in the medical building. Andrea treats a number of conditions effectively with acupuncture. She also specializes in women’s wellness (including infertility treatment), holistic pediatric medicine, autoimmune disorders, psychological disorders, as well as many chronic and acute pain conditions. As stated previously, she has many years of training in western medicine as a registered nurse working with children, and later adults seeking infertility treatment. As director of Nursing at Fertility and Genetics in Plantation, she has an in depth understanding of assisted reproductive technology including procedures such as IVF and IUI. Acupuncture is an ancient art that is more effective and powerful today as it ever was. If you’re tired and frustrated with the western medical experience, you owe it to yourself to explore acupuncture, Chinese and Holistic Medicine. It is safe, it is relaxing and most importantly, IT WORKS! Give Dr. Andrea Schmutz a call today to get started. Insurance is accepted. The number is 786-537-7022.